Should Parents Tell Employers About Their Child's Special Needs? Kids with special needs have, well, special needs. These needs not only present my kid with a lot of challenges; sometimes they mean I need to take unscheduled time off work. (It’s just how it is.) Aside from the time I need for standard IEPs, evaluations, school visits, and the like, my kid has also spent a fair amount of time in the hospital. My kid isn’t the type you leave and say, “be nice to the nurses.” You just don’t do that to a minimally verbal kid with intellectual disability. When my kid is in the hospital a parent has to be there. Which means no work during that time. When my kid was in the hospital, keeping my manager in the loop was not my main priority. I thought leaving a message on his voicemail, such as, “I’m in an ambulance with my son. It’s two AM and I’ll be out tomorrow” was sufficient, but I didn’t think about the fact that these stays might be multi-day stays, so my manager needed updates. I dropped the ball on that a few times. I was somewhat preoccupied and didn’t realize that follow up calls were helpful to him. So when I decided to change to another job, I told my prospective future company about my kid and the fact that it was more likely that I’d take emergency time off than the average employee. That I’d endeavor to communicate well in those events, having learned the importance of communication from my previous job. In the end no emergencies came up in my relatively short time with my new company. I had almost no lost time due to my kid. In fact, I was so eager to make an impression at my new position that I didn’t take as much time to stay in good contact with his teachers. I probably took less time away from work than an average parent would. The new company and I ended up not meshing well, and I decided to find another job. When I informed my manager I was leaving, he was a bit surprised and clearly unhappy with my decision. But his explanation for why I was unhappy in my job didn’t match what I had just told him, which tells you a bit of why I was leaving. As he tried to convince me to stay, he told me he “understood” that the pace of the job was probably more than I was used to (bad enough when my complaint was that there wasn’t enough work for me) and that “my family situation” (code for “child with special needs”) was affecting my ability to work. I know this guy well enough to understand what he was doing: he was thinking out loud. Thinking of the story he was going to tell his management for why I left. And, of course, making sure he would not be blamed. As I’ve said: if anything my job was taking away from my ability to spend time with my kid with special needs, not the other way around. You can imagine at this point pretty much any chance that I might stay with that company was lost. I know I set the stage for my ex-manager’s response by telling the company about my kid, but I never expected my disclosure to be used against me. People who don’t have kids with complex needs can’t fully comprehend my work situation, just as I don’t fully comprehend the situation of parents without a kid like mine. I don’t think there’s a good excuse for my manager creating the false story that my kid kept me from doing my job, but I relearned an old lesson: don’t make a big deal out of having a child with special needs. I usually don’t. He’s my son, and I’m very proud of him just like any other parent is proud of their kid. I have no intention of pretending he’s anything other than who he is, if the subject comes up. Just like the other parents at any job I have, caring for my child will cause me to miss work. Maybe I’ll miss more work than other parents, But what I’ve learned is that I need to communicate about what is going on when and if it happens. And only then. I had no idea autism acceptance and understanding in the UK were so much more culturally ingrained than in the US. Granted, there is still much work to do, and government cutbacks in housing for people with disabilities continue, etc. But the disconnect was shocking. And, I was told, much of it had to do with the National Health Service covering autistic people's needs as a matter of course. Families don't need to worry about paying for autism services; they need to worry about getting their kids and family members and selves appropriate services. As a result, according an American parent friend who lives in Yorkshire, there is much less of the catastrophizing of autism than we see in the States. I witnessed these attitudes and approaches during the National Autistic Society's (NAS) Professional Conference 2014 in Harrogate. I saw an effective national autism organization that includes and supports autistic perspectives and needs and makes those factors primary, while still very enthusiatically supporting and educating parents and professionals. That provides families of newly diagnosed kids with several weeks' of educational classes, plus home visits. 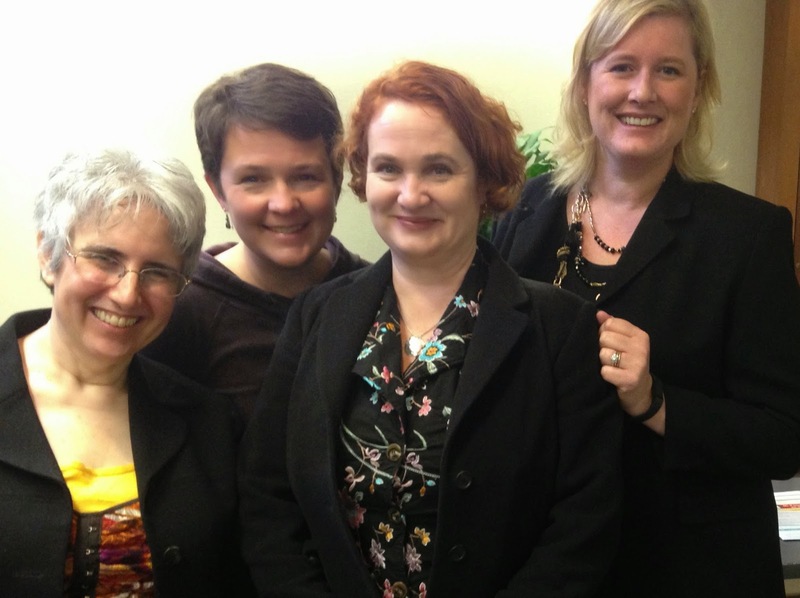 That had a large number of autistic speakers at its conference for professionals. It was a revelation. horizontal red line, reading "Accept difference. 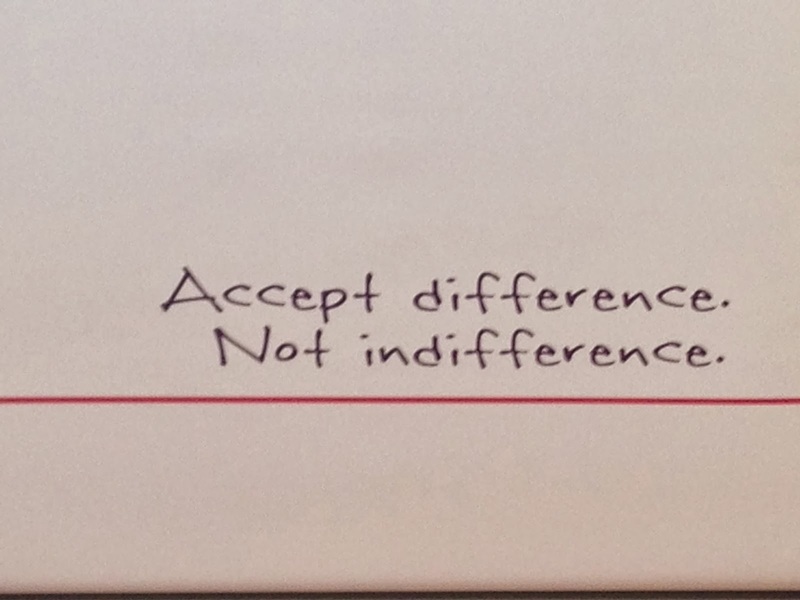 Not indifference." I was there because filmmaker and autism sibling Saskia Baron kindly advised the NAS to invite me to give a presentation on iPads and Apps for Learning and Leisure. I showed up in standard conference mode: excited to be of use in sharing information that attendees would hopefully find helpful. (Autism consultant Dr. Peter Vermeulen tweeted that I told a "Very balanced story about apps for autism: presenting the advantages and opportunities as well as mentioning some caveats.") But I did ever so much more learning than I did educating. 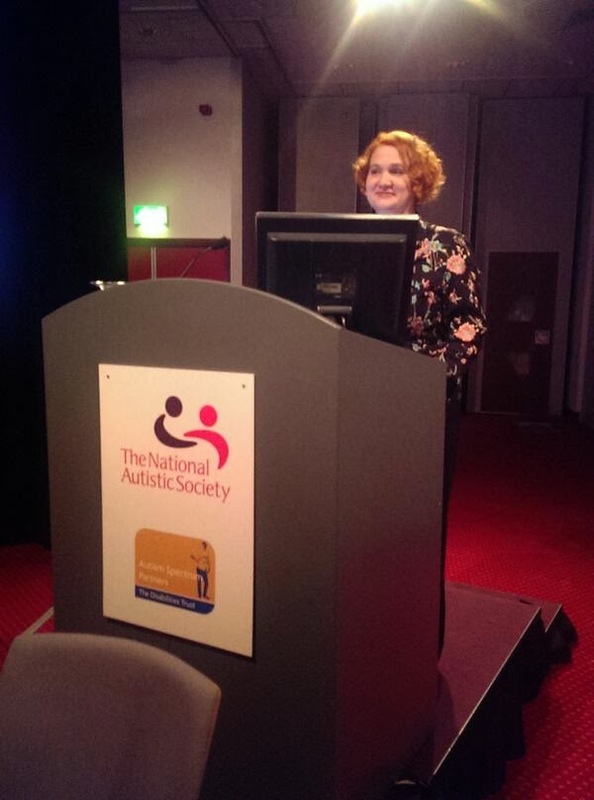 "The role of the #NAS @autism is to challenge misconceptions about #autism." -Mark Lever on the media's "poverty of understanding"
"We need to put the #autistic child/person at the center of what we do. Proper support means happiness, independence, employment." "The #NAS @autism is working to capture actual numbers of #autistic people in local health authority areas. How else can people be supported?" The media's misconceptions about "shirkers not workers" is one hurdle in the #NAS's @autism working towards positive #autism representation. "We shouldn't want #autistic people to be less autistic. We should want them to be autistic and happy. -@Peter_Autisme #autism #NASprof14"
Please feel free to leave comments or questions (or to tell me what a Pollyanna I'm being). But even if I'm mistaken about UK attitudes towards autism in general, I know what I saw at the conference itself: autistic people, and people who accepted autistic people for who they are, and who were working to improve autistic people's quality of life. I hope American autism conference organizers are reading this post, and taking extensive notes, because American autistics, families, and professionals deserve a conference like the NAS Professional 2014.